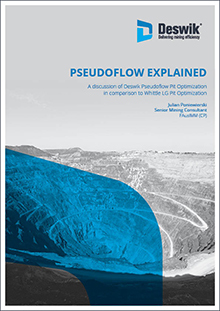 The purpose of this paper is to inform the user about Deswik Pseudoflow, within the context of the mining industry’s most accepted pit optimization process that uses Whittle software based on the Lerchs-Grossman (LG) algorithm. In summary, both are variations of network flow algorithms that achieve the same result, with the pseudoflow algorithm being a computationally more efficient algorithm developed some 35 years after the original Lerchs-Grossman algorithm (1965). It took 20 years from the formulation of the LG algorithm for it to be incorporated in the first commercially available software (Whittle Three-D), with another 10 years before it became a mainstream approach to open pit optimization. In the past 30 years, Whittle and the LG algorithm have become synonymous with the optimization of open pits, and now suffers from having become a generic term for the process of pit optimization– similar to the genericization of the Hoover brand with vacuuming in the UK (such that in the UK, people hoover their carpets). It is now 15 years since the formulation of the pseudoflow algorithm, and there are at least three commercial implementations available, including Deswik’s implementation. Just as “hoovering” does not need to be a Hoover vacuum cleaner – indeed the Dyson cyclonic vacuum is recognized as far more efficient at vacuuming– the pseudoflow algorithm should now be used to replace the LG algorithm in “whittling” your pit optimization. It should be noted that the Deswik implementation is not constrained (nor is it aided) by the extensive set-up parameter tables and inputs provided in the Whittle software for cost and revenue calculations. For Deswik’s pseudoflow implementation, the user is required to calculate the revenues and costs for each block in the block model used, and is required to do their own block regularization within the Deswik.CAD environment. The user is thus in full control of how the costs and revenues are calculated and assigned. This does however require the user to be fully familiar with their block model, cost structures and revenue parameters (which we believe is a “good thing”). This enables the set-up to be as flexible as required by the user (unconstrained by template set-up dialogs).